It’s an overly simplistic view of tastes which spanned half a century, could test even those who consider themselves musically unshockable and embraced an often-overlooked predilection for novelty. What’s unarguable, though, and was something Peel took pride in, was his forward-looking, close to scorched-earth attitude. He took only his most prized memories with him and few of those dated from the early ’70s. When the Strange Fruit venture gave overdue official releases to sessions previously blighted on tape by unbidden coughs and unsolicited percussion from the kitchen sink next door, his lack of enthusiasm for that era was palpable – he was perplexed by his one-time fondness for “unutterable crap like James Taylor” but alongside oft-proclaimed stalwarts like Beefheart, Robert Wyatt and Kevin Coyne, one of the few to escape the Me Decade purge were Family. This wasn’t particularly surprising. Family tend to be conveniently dropped in the prog bag these days and while that was one of the points on their compass – it undoubtedly describes possibly their best-known song, the deathbed drama Weaver’s Answer, though that’s one I’ve never got on too well with – they rarely had the requisite pomposity or verbosity. Only four songs across their seven albums exceeded six minutes and they were just as likely to dally with folk, R & B, psychedelia or flat out hard rock. They weren’t inherently seers or visionaries – and I’d suggest they had that in common with the Beatles. But also that both bands had insatiably curious ears and a willingness to try anything, while always having their R & B/ R & R roots within grasp and returning to them as they neared their respective ends. In fact, one of the most frequently told anecdotes about Family is that they were among the very few who ever got their way at the expense of the Beatles. They nabbed the title Music In A Doll’s House for their 1968 debut while the Quality Quartet – who had mooted a similar title for their upcoming album – prevaricated, compelling them to go eponymous and White a few months later. It’s also often observed that they were named Family by Kim Fowley, as their sharp-dressed, imposing demeanour put him in mind of East Midlands mafiosi. Not quite the full Corleone but definitely one of the most convincing gangs-as-bands of their era. Liam Gallagher fondly sees their Leicester successors, Kasabian, as a gang but does so merely by defining them, Paul Calf-style, in opposition to stuuudents. But what he thinks Kasabian are, Family actually were – they simply got on with job of, if not upsetting the hippy applecart, then at least discombobulating it. An extended Family too – in common with another true gang, the Ramones, they adopted when siblings went astray and racked up 11 members in their seven years (perhaps more like a football team – after all, they were depicted as Leicester City players on the cover of a posthumous Best Of album and were introduced at their 2013 reunion gigs by the legendarily free-spirited former Foxes striker Frank Worthington; Gary Lineker was presumably unavailable). And like yet another, Dr Feelgood, a surfeit of Johns pressed nicknames and middle names into service, so that John Whitney became Charlie, John Palmer was reborn as Poli and, for his time as a Family guy, the late John Wetton was dubbed Ken. John Weider had the privilege of getting to keep the name. It all added to the picture of an outwardly ramshackle yet acutely questing squad, though by the time of Bandstand, their penultimate album, a degree of professionalism was in place. There had always been spiny tangents to their sound – Peace Of Mind from …Doll’s House (which the Damned, psychedelia connoisseurs that they are, were most assuredly familiar with, if their Disco Man is anything to go by) was underpinned by the carpet burn violin of Ric Grech, shortly before he was poached by Blind Faith; Hung Up Down from 1969’s Family Entertainment had woven into its belligerent stomp a flute which, given time, starts to make sense but never ceases to be slightly incongruous, and Save Some For Thee from 1971’s Fearless was all but thrown off course by the almost non-sequitur intrusion of a marching band. 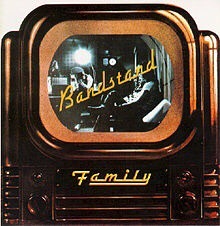 Bandstand was one of their most conventional outings but was still also one of their most diverse and inventive – their shirts were still hanging out but one or two of them were at least sometimes wearing ties. flailing limbs as from his gargling-with-sand vibrato – both among the attributes which caught Peel’s attention the most. “You were always grateful for a few bodies between you and Roger,” he once observed, and Chapman was one of the most obvious manifestations of his penchant for extreme vocalists. As unlikely as it may seem, Chapman had a good deal in common with another, Marc Bolan – it was polymorphism for the ears. If Bolan was diamond, Chapman was graphite. You can hear all of this coalesce on Bolero Babe, which, in time-honoured Peel-challenging fashion, fades in to proto-synth bleeps and Rob Townsend’s drum tattoo nodding vigorously to Ravel’s classic a full decade before anyone had thought of skating to it, while showing it was equally suited to looning. The lofty strings echo those which Bolan and Tony Visconti superstitously put on T Rex singles after the success they brought Ride A White Swan, as well as anticipating, oddly, those of Massive Attack’s Unfinished Sympathy. Where you expect a chorus to surge and thrust, you can almost hear this one being held back – as Chapman exhales: “I can see it shine/ Light years from here” is he declaring “its” mighty brightness or silently adding: so why bother going to it? But this sounds not like proto-slackerdom, nor the indolence which had become so prevalent, but a protective restraint. Dark Eyes, by contrast, is a whisper that fills a room. Less than two minutes long, it announces itself with the most sweetly discordant piano you’ll ever hear, an acoustic guitar pirouettes and a double-tracked Chapman sings, not for the last time on this album, with compassion and empathy (“A shadow of the evening/And your baby at your side/ A sadness that’s within you/Your eyes refuse to hide”). A flute adrift from Bryter Layter finds shelter before the sudden fade – it all sounds as soothing as pretty much everything was for me as a pre-school child while they recorded this. I was oblivious to this song, this band, and to the turmoil they soundtracked that was as prevalent as it’s ever been – Dark Eyes occupies the gap between those worlds. As, to some extent, does My Friend The Sun, which could be interpreted as an opportunistic pitch to Rod Stewart’s by then massive audience. But it’s not remotely calculated and even if it was, cause shouldn’t be emphasised over effect, as it’s simply the most beautiful thing Family ever did. It’s bucolic without emphasising the colic, the sound of that morning moment when you realise it doesn’t matter if you don’t do a thing all day. Chapman is again at his warmest- “I know that you’re lonely, come in from the cold/Your shoes they need mending, your clothes they look old” – and if, as we’re often told, the difference between violin and fiddle is attitude, this song is poised at the exact moment where the attitude switches. Harmonies descend like a freewheeling downhill cyclist though, as if to remind us we’re still dealing with the Strange Band, the tape lead is dislodged and reinserted at the very last moment. And no busker’s bass drum and tambourine to create an unnecessary Mumfords hoedown 40 years before the fact. It’s said to have been played at a number of funerals in recent years, reflecting a shift from mourning who we’ve lost to celebrating who we had and fitting to the bittersweet brew of this song. Far more bitter than sweet – in fact, a riot – is Broken Nose. For precisely three seconds, it offers the promise of a Hispanic voyage – Crude Sketches of Spain, maybe – before becoming a barrage during which the titular injury could easily occur. The chorus stomps through the floor and waves to Sly and the Family Stone’s I Want To Take You Higher on the floor below, before all is subsumed by the swell of a Charles Babbage synth. Somehow, room is found for one more layer in the backing vocal of Linda Lewis, later to have a hit with High Wire and to cover My Friend The Sun. .Closer Top Of The Hill opens like a soul stew, twinkling and bubbling to set the scene for the entrance of Stevie Wonder, Al Green or even Alan Toussaint. It maintains this pretence for more than a minute before a terse riff kicks down the door and a clenched, breaking-point drama barges through. It simmers with unresolved tension as the strings swoop like a squadron of pterodactyls and race Palmer’s vibes to the summit. But they’ve not seen Townsend surreptitiously scaling the south face and he gets there first – with an unforeseen snare roll, he plants the flag and Bandstand is done. Family had one year left. They would sign off with It’s Only A Movie, which largely took its cue from Bandstand’s opener Burlesque – a song which gave them their third and last top 20 hit and, with its bawdy Faces stomp, really was an incursion into Rodland. They split in, it would appear, comparatively amicable circumstances, too soon to be sitting ducks for punk ire but, despite their prog toppings, their vigorous bravura might have spared them the worst of it – in fact, a decade and a half later, the very same accidental urban sage spirit would be all over, under and inside Happy Mondays. They stayed split for a full 40 years and even those reunion gigs were a brief visitation, played, furthermore, without the now seemingly retired Whitney. The reverence handed down through the generations to Zeppelin, Floyd and Sabbath has eluded them but at their best, they rivalled them for, respectively, tenderness abutting steamhammer momentum, what-does-this-button-do inventiveness and realising industrial landscapes in blasted, lurid sound. If that makes them prog, I’ll get my cape (PG).